AP Public Service Commission Group-II Recruitment 2016: Andhra Pradesh Public Service Commission (APPSC) released Group –II Recruitment Notification on 8th November 2016. This recruitment notification of APPSC is for Executive & Non-Executive posts. Details of Executive & Non-Executive posts (recruitment is for which post) are given below including how many vacancies available for each post. The overall vacancies available in this 2016 Group-II recruitment are 982 executive & non-executive posts. AP Public Service Commission (APPSC) is inviting all the eligible and interested candidates to apply for this Group-II recruitment through online and the online applications are active from 11th November 2016 in the official website of APPSC www.psc.ap.gov.in. The candidates who are preparing for Groups/any government job and who are eligible & interested in this recruitment can apply for this recruitment through online on or before 10th December 2016. Before going to apply online for this Group-II recruitment of APPSC, Check out the entire details of the notification it will clear some of your doubts relating to this recruitment in the sense of eligibility criteria, recruitment procedure, written exam pattern and syllabus etc. In this article we provide all the essential details of this APPSC Group-II recruitment notification like age limits, educational qualification, Application fee, Recruitment process, Pattern of Written exam etc. we hope that these detail will helpful to the candidates to get an idea about this recruitment. No. 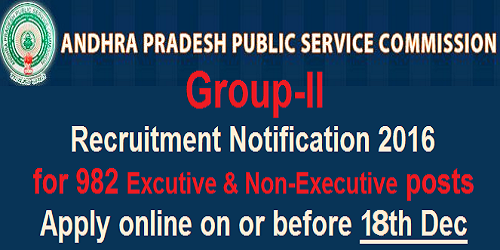 of Vacancies: Total number of vacancies available in this Group-II recruitment is 982 posts in both Executive & Non-Executive category. Vacancies details for each category including Pay Scale information are given in detailed manner go through it. Age limits: Age is considered as on 1st July 2016 and upper age relaxation is applicable for all reserved category candidates. - Must hold a Degree in B.C.A/B.Sc (Computers)/B.Com (Computers)/B.A (Computers)/B.Tech or B.A with Computer Science or Information Technology or its equivalent examination from recognized University Institution. Application & Examination Fee: Examination Fee is exempted for SC/ST & BC candidates of AP state, Un-employed youth in the age group of 18 to 42 years belonging to AP State, Families having Household Supply white card issued by Civil Supplies Dept. of AP State, PH and Ex-Servicemen. Note: Pay the Fee through online Payment Gateway using Net Banking/Credit Card/Debit Card. 2. Main Examination (Online Mode): This Exam contains 3 paper 150 marks for each section and the exam will be conducted in 2 days. Paper –III: Planning in India and Indian Economy Contemporary problems and developments in Rural Society with special reference to Andhra Pradesh. 3. Qualifying test i.e., Proficiency in Office Automation with usage of Computers and Associated Software (50 Marks) will be conducted for all Non-Executive posts and also for Prohibition & Excise Sub Inspector post. Physical Standards Test will be conducted for Prohibition & Excise Sub Inspector post. 4. Final Selection of candidates list will be declared for appointment based on the merit marks of Main online Examination. Online applications are opened from 11th November 2016. Closing Date for online applications is 18th December 2016 up to 11:59 PM. Closing Date for fee payment is 18th December 2016 up to 11:59 PM. Screening Test will be held on 26th February 2017. Main Online Examination will be held on 20th & 21st May 2017. 3. After succefull completion of OTPR, candidate can get an OTPR Reference ID. 4. OTPR Reference ID will be Usefull in Group-II online application form. 6. Choose Group-II Services Radio Button and click on Continue button. 7. Click on the Check box and enter OTPR Reference ID then click on Go Button. 8. Fill the online application form carefully. 9. Take a print out of online application form after successful submission of it.